Thanks so much to everyone (humans and dogs) who played a part in making Poochamania 2018 at the SAHS a huge success. Your support truly means so much to our pets, staff, volunteers, and Board of Directors! What's better than a human-friendly event? A human and dog-friendly event! 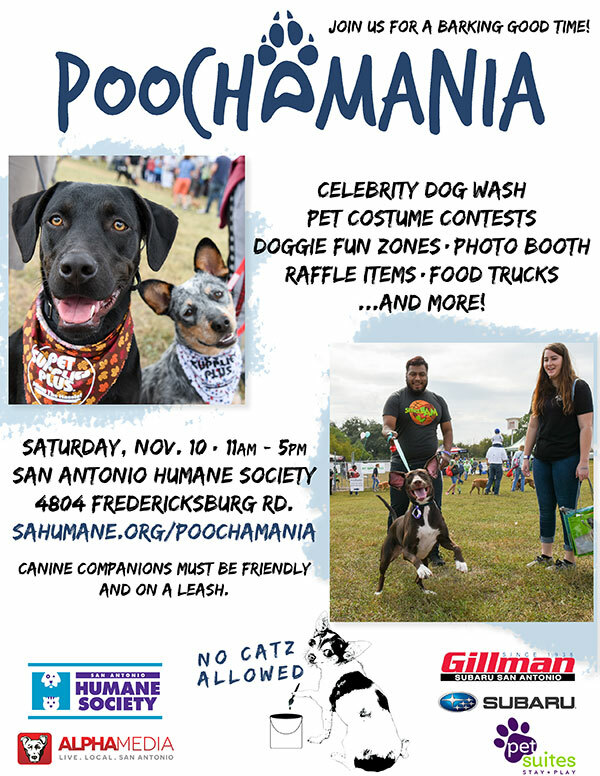 In partnership with Alpha Media and presented by Gillman Subaru SA and PetSuites, we invite you and yours to join us at Poochamania! Celebrity Dog Wash, Pet Costume Contests, Doggie Fun Zones, Photo Booth, Raffle Items, Food Trucks, and More! -Follow parking signage the day of the event. -All accompanying canines must be friendly and on a leash. A portion of the proceeds benefit the dogs and cats at the San Antonio Humane Society.